There’s another pathway to help get young adults, ages 18-30, into the workforce. An open house and information session will be held at 6 p.m. Tuesday at the Defiance Dream Center Plaza, 1935 E. Second St., Defiance, for young adults from Defiance and Paulding counties to learn how they could earn a free certificate or credential in one of three different workforce skills. Skills include basic construction trades, automotive technician and autonomous maintenance. The eight-week program is a partnership among Impact 419, the Defiance Dream Center, OhioMeansJobs, Defiance ‘County Economic Development and Northwest State Community College (NSCC). The Defiance Dream Center has a life-coaching initiative that covers 20 different pathways. Two of the greatest needs identified in the community were transportation and workforce. The Dream Center opened an auto care center July 2018 and have completed 42 vehicle repairs to date for single mothers, widows and military wives, while also providing training and volunteer opportunities to those interested in vehicle repair. An automotive apprenticeship began to develop as well. This was later joined by a construction center, where various needs are being met, including home projects in the community. Individuals are learning construction skills through apprenticeship, as well as receiving life coaching. “One of the workforce needs in our community is for skilled trades. Various employers are now asking the Defiance Dream Center to be a feeder system to help fill some of these openings,” said Bill Lammers, president and chief executive officer of the Dream Center, which opened in 2017. To meet the need and help the community, seven workplace simulated cells were installed at the center, with a goal of 15 in 2020. Lammers and Jim Drewes, director of workforce development at NSCC, had been talking about partnering up for a while before being approached by Andrea Morrow of Impact 419 about a collaboration. After attending a Defiance County Economic Development Office meeting, the various entities decided to partner to bring an opportunity for workforce training to the area. Morrow said the three pathways — basic construction trades, automotive technician and autonomous maintenance — are the pilot program. Drewes said NSCC will be supporting the program by providing technical equipment. Basic construction trades — basic carpentry, residential electrical, plumbing, welding and earning a forklift operator’s license. Automotive technician — oil and filter basics, tire and brake basics, coolant and radiator basics, electrical systems basic and earning a forklift operator’s license. Autonomous maintenance — safety, quality practices and measurement, manufacturing production and processes, maintenance awareness, green production and earn a Manufacturing Skill Standards Council certification. 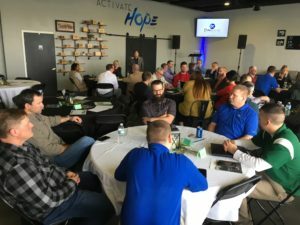 “The leadership team has refined the curriculum to help meet the workforce needs,” said Guiseppe Blanchard, director of operations at the Dream Center. He said currently plans are to have classes going from 8:30 a.m.-4 p.m. Monday through Friday, but that may change as things progress. Once the first eight-week workforce pathways are completed, others will be added. Morrow said that organizers would like to have at least 12 students for each of the pathways offered. For those who are eligible for the pathways, training will be provided at no cost to them. Lammers also stated that employers and community members may sponsor a student through the program as well. Carla Hinkle, workforce development manager for Defiance County Economic Development, said that while the young adult workforce pathways are underway, officials are looking to offer similar eight-week classes to high school students in the future. For more information about the Dream Center and its mission, visit defiancedreamcenter.org.